Have you ever read a book and found yourself completely distracted by an author’s overuse of the same word(s)? Hopefully not. Hopefully those little darlings were caught and thrown out by good editors and/or great crit partners long before the book hit the shelves. But I’d be willing to bet they were there… at some point. It would be nearly impossible for writers—people who absolutely looove words—not to have a few favorites, right? Here are a few of mine, as pointed out by my awesome crit partners: suddenly, finally, blurted, sputtered, screeched (oh yeah, and... ellipses). So let’s hear it… are there any words that you love? Or overuse in your writing? Or hate to see in print? The ending of a book can make or break the story. If an author leaves us hanging or feeling cheated, we may never forgive them for it. A satisfying last line can also gain our love forever. But is there a right way to end a story? The most common type of conclusion happens when there’s no story left to tell. EMMA by Jane Austen — and every Jane Austen book, for that matter — ends with all the main characters finding true love. On one hand, these endings can be predictable and a little too perfect, on the other, happily ever afters have stood the test of time. Other authors leave the outcome for the reader to interpret. The main conflict is resolved, but we have to use our imaginations to know what happens next. At the end of VILLETTE, Charlotte Brontë leaves hints of sadness to come, but allows us to believe in a happy ending where Lucy and Paul are reunited if we want. Real life is full of unanswered questions, and sometimes we like to fill in the blanks ourselves. Epilogues and denouements often inspire mixed feelings from readers. Some people can’t stomach them, but I don’t think they will ever completely disappear. In THE RETURN OF THE KING by JRR Tolkien, do we really need to know what happens after the ring is destroyed and Aragorn is crowned king? Nah. But would the story be the same without the bittersweet moment when Frodo sails to the Undying Lands? There are a million different ways to end a story. Some books end with a twist or bring us back to where we started, and we see a familiar scene with new eyes. Others just stop and leave you wondering why the heck you read it in the first place. Sometimes the end of a story is the end of a life, or a fresh start after the protagonist has discovered who they are. We’ve seen lessons learned, mysteries solved, relationships mended, villains defeated, and worlds saved. There is no right or wrong way to end a book. We all want a conclusion that feels satisfying to us, but there’s no ending that will please everyone. Authors choose the way that feels best to them, and people will love or hate them for it. That’s life. Story endings are a source of endless debate, and that’s part of the fun. So what kind of conclusions do you like? What do you hate? In fact, all of my best memories are with friends. Eating lunch together at a picnic table in the school courtyard. Playing soccer on the weekends. Road-tripping to visit each other in college. Watching Grey's Anatomy on someone's sofa, or going to the theater to see latest chick flick. As much as I love a good romance, I think the friendships in stories are just as important. Your friends are a reflection of you -- the things you like to do, the qualities you enjoy in other people -- so if I don't like a main character's best friend, there's a good chance I won't like the main character either. What do you get when you mix a mischievous, rough-around-the-edges orphan with a sweet, proper, and somewhat boring girl? A whole lot of laughs and adventure. 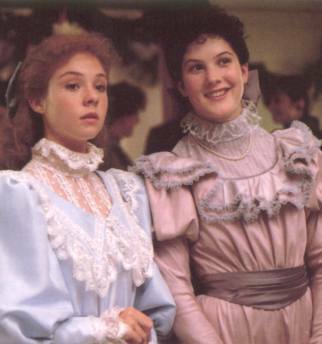 Anne Shirley and Diana Barry were the original "bosom buddies," and I loved how they interacted, each pushing the other to learn and grow. Anne convinced Diana to bend (or break) a few rules, to set her imagination free. Diana showed Anne how to be a lady in modern society, introducing her to a world of wealth and beauty. Together they were the perfect combination of dream and reality, passion and practicality. They helped each other become better people, and they stuck by each other throughout their lives. 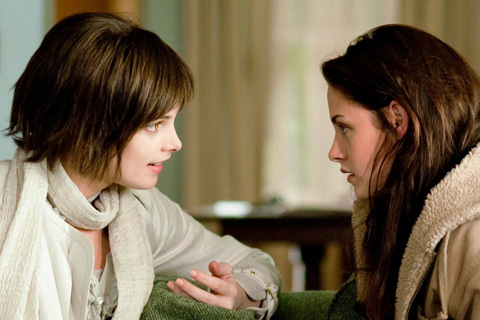 As much as TWILIGHT focused on the love between Bella and Edward (and Bella and Jacob), I think the friendship-love between Bella and Alice was a big part of the reason I enjoyed the series so much. Alice was cute and quirky, full of personality. Plus she could see the future! Who wouldn't want a best friend with that power, right? Okay, it wasn't always fun. But (SPOILER WARNING) when Edward leaves Bella, who did she write to? Not him. To Alice. Alice was the one she felt she could confide in. Alice was the one she spilled her broken heart to. And later (SPOILER WARNING AGAIN) Alice is the one that Bella lets throw her a party, pick out her clothes, and even plan her wedding. If that's not a sign of true friendship, then I don't know what is. Can I confess something? I never cared who Harry Potter fell in love with. Because to me, he already had his soul mates in Ron and Hermione. They stuck with him through everything. They risked their own lives for his. They made him smarter and stronger by being his team. Sure, each of them had faults and weaknesses -- but when they worked together, that didn't matter, because they could cover for one another. They always had each other's backs. And best of all, they were funny too! All right, those are some of my favorite book friendships. What are yours? Congratulations to Carol Riggs, Zakiya LadyWings, and Brittany (loves books) -- you guys won our first ever giveaway!! Please email us (weheartya at gmail.com) with your mailing address and we will get these books out to you as soon as possible!